World of Concrete 2019 offered plenty of product news and intrigue about the industry’s long term health. PDi’s editor Jim Parsons reports. 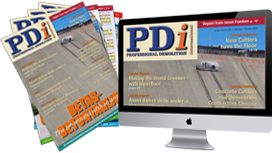 Here is PDi’s annual feature comprising of new crushing and screening buckets for demolition and recycling applications. Jan Hermansson reports. PDi Magazine is sad to report that a great concrete cutting professional passed away on 14 January, 2019. The Hilti Group has reported sales of approximately €5.1B in 2018, this being a 10.7% increase on the previous year. Yanmar has announced plans to establish a manufacturing plant in Chennai, India to produce industrial diesel engines. Atlas Copco has acquired German Industrie Pumpen Vertriebs GmbH (IPV), the distributor of industrial pumps for the Varisco brand. The exciting capabilities of the Allu range of Transformers have seen leading Finnish recycling company, Remeo, invest in a D series attachment. Words from the EDA President: The more the merrier! Words from the IACDS President: Are we competitors or are we collaborators?